The Sony Xperia Z3 and Apple iPhone 6 are both expertly-crafted flagship phones, but which one is better? If we look purely at sales, we’d have a clear winner. The iPhone 6 has sold monumentally well for Apple, and still growing, while Sony’s Xperia range has been struggling to gain a following. But examining these devices once again, does the iPhone 6 really outshine the Xperia Z3? 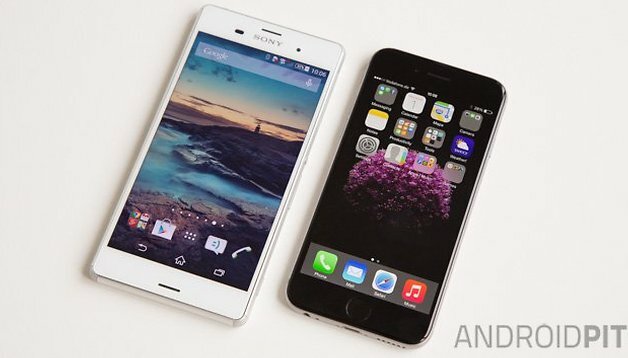 Find out with this in-depth Sony Xperia Z3 vs Apple iPhone 6 comparison. Sony’s Xperia Z devices follow its Omni-Balance design aesthetic, which aims to blend premium materials with a thin, lightweight, waterproof and dustproof body. Sony has been successful in its vision; creating an attractive device which is a joy to hold with softly rounded edges, and subtly reinforced corners aid its durability. The Xperia Z3's aesthetic won’t appeal to everyone, though: it’s a big rectangle with large bezels, and the waterproof design necessitates a flap for the charge port which, given the frequency of smartphone charges, can quickly become annoying to operate. The iPhone 6 uses similar high-quality materials befitting of a flagship smartphone. Anodized aluminum on the back with a stainless steel Apple logo, and a beautiful glass-covered face. It’s silky smooth to hold, smaller and more rounded than the Z3, but with a protruding camera sensor on the rear. By comparison, the back of the Z3 is completely flat. The iPhone 6 also has a physical home button which the Z3 lacks. Both devices are thin, with similar sides, the iPhone 6 at just 6.9 millimeters and Z3 at 7.3mm, but the Z3 is significantly heavier at 152 g as opposed to the iPhone 6’s 129 g. Neither device has a removable battery, but the Xperia Z3 does have expandable storage via a microSD card slot. To sum up, the Z3 is taller, wider, thicker, heavier, with a microSD card slot, and is waterproof but as far as Android and iOS devices go, theses aren’t worlds apart concerning design. Both represent sleek, tight engineering and they look stunning. The Xperia Z3 has a 5.2-inch full-HD (1920 x 1080 pixels) display with 424 pixels per inch (ppi). While it can’t compete with the pixel density on modern QHD displays, it remains a high-quality screen. Utilizing Sony’s Triluminous technology, it’s fantastically bright, with great viewing angles and visibility in direct sunlight. It does have a slightly purple hue, however, which is noticeable on what should be pure white backgrounds, but most displays have a small color bias. The iPhone 6 display is about 10 percent smaller than the Z3 at 4.7-inches. It’s a Retina HD LCD screen with 1,334 x 750 pixels and a pixel density of 326 ppi. And it’s even brighter than the Xperia Z3. The Z3’s display is larger, and higher resolution so media content and games played on it look better than on the iPhone 6. But because the iPhone 6 display is more compact, and sharper on the homescreen/app drawer. The buttons and text appear more defined, the Z3 looks a tad blurry by comparison. Despite the excellent Snapdragon 801 processor housed within the Xperia Z3, the iPhone 6 is still faster. Apple optimizes its hardware and software extremely well, so even with less cores and lower core speeds, the iPhone 6 processor still makes for a nippier handset. That’s not to say the Xperia Z3 is slow or unstable, but with multiple notifications queued you will see a difference in how quickly you can navigate between apps and screens. The iPhone 6 is, somewhat crucially for people like myself, quicker to launch its camera. With iOS 8 and Android Lollipop, these OSs are arguably the most similar that they have ever been. Now the Xperia Z3 is running Lollipop, the difference between these handsets is even less tangible (read our iOS 8 vs Android Lollipop comparison for more on that). Sony’s camera technology is first-rate and is the reason it’s often used in other Android smartphones (like the Galaxy S6 and S6 Edge, for example). The 20.7 MP camera on the Xperia Z3 is outstanding. It’s highly detailed, and always crisp and clear (though it’s reds often look pinkish, and it struggles a bit in low light). The iPhone 6 uses an 8 MP iSight camera, with True Tone flash and f/2.2 aperture. What the iPhone 6 lacks in raw pixels (with almost half as many as the Z3) it once again makes up for with clever integration. The iPhone 6 camera performs brilliantly, with many smartphone fans still convinced that iPhone cameras are the best on any phone in the world. The Xperia Z3 has a large 3,100 mAh battery and excellent battery life. It's one of the longer-lasting handsets among current Android flagships, and it's somewhat helped along by it’s HD (rather than the power-hungry QHD) display. The iPhone 6 battery comes in at 1810 mAh, and in this instance, despite well-optimized hardware, the Xperia Z3 beats it. The iPhone 6 battery won't drain as fast during the night, but in almost all other areas it will run out quicker than the Xperia Z3. Approximately 700 USD (16 GB), unlocked. Approximately 500 USD (16 GB), unlocked. On paper, the Z3 is better than the iPhone 6 in almost every way. It's heavier, and marginally thicker, but these facets aside it looks more impressive all round. So it’s definitely the better handset, right? Not exactly. The iPhone 6 has such a splendidly optimized system that, in practice, what seemed like easy wins for the Xperia Z3 turn out to to be much more complex. This is one of those comparisons which highlights just how misleading tech-specs can be. The Xperia Z3 is an out-and-out winner if you want to play Top Trumps with the specs. In the areas that count, it’s almost twice as good, in most cases. But when you sit down with both of them and ignore what you're being told about what’s inside these phones, but actually cast a critical eye over them, you see that the iPhone 6 isn’t nearly as “lightweight” as it appears. That being said, the Xperia Z3 clearly has more battery power, expandable storage, waterproof capabilities, and it’s significantly cheaper. Despite its low sales, and despite excellent Apple engineering, the Xperia Z3 is still better overall. Of the two models I prefer Sony, and that's what it says for one reason: Sony has Android! Regarding the specs, xperia z3 has 20.7mp rear camera and 5mp front cam. I'm using xperia z3 compact and it's great! I don't have to charge it everyday. By the way, one tip for z3, buy a charging dock so u don't have to open the battery cover everytime you charge the phone. I owned a z3 and recently got a 6 plus. 1st the display.. how on earth can u say that text is sharper on iphone cuz its small and blurry on xperia? 2ndly if u managed to know a bit about display u would know that sony's display is more towards Red tint rather than Purple. 3rd. the camera comparison.. i am shocked that i can take better pictures with my old nokia... Xperia z3 has a class leading camera. what a pathetic article.. I am a apple fan but this article was just absurd.. The title was enough to show how much biased u r.
Actually, iPhone 6 uses Sony Exmor sensor as well. I've never been a fan of Sony's HDR mode, it's washed out as per the above photo, so I think it should've been taken on auto instead of a certain preset which applies to both devices. How did you take those pictures?? In Auto with 20,3 mp on Sony? I think it takes better pictures with 8 mp manuel. Could you replicate those photoshots in that mode? And would it not be more interesting to take the test with the upcoming Z4? I took the photos in 8 MP (4:3) manual mode with HDR switched on (I mention the settings in a caption, but in hindsight I probably should have put it in the body). It's the highest resolution which offers high dynamic range to compare with the iPhone 6 and also maintains the same ratio: seems like the best / most clear way to do it. But yeah looking forward to a Z3 vs Z4 comparison because I'm a big Sony fan. Have used both!! IPhone 6 wins in Internet. Truth is battery socks, xperia z3 is awesome not bad as what everyone really says on it. It's far better than iPhone 6.. Camera calibration and xreality feature is good but image is not bright as iPhone 6. And why you guys didn't compare the iPhone6 with the Z3 compact is beyond me since they are much more alike. Color me seven shades of embarrassed. I'll change that screenshot ASAP. More of our readers have the Xperia Z3 and we thought it would be more interesting for them first and foremost. We try not just to compare devices which are "alike" and instead look at why which device is better/worse. I'd like to do Z3 Compact vs iPhone 6 comparison though, personally. I wonder how the change in battery life would affect my overall thoughts.